Partnership that keeps rolling and rolling ... and rolling! Partnership that keeps rolling and rolling … and rolling! 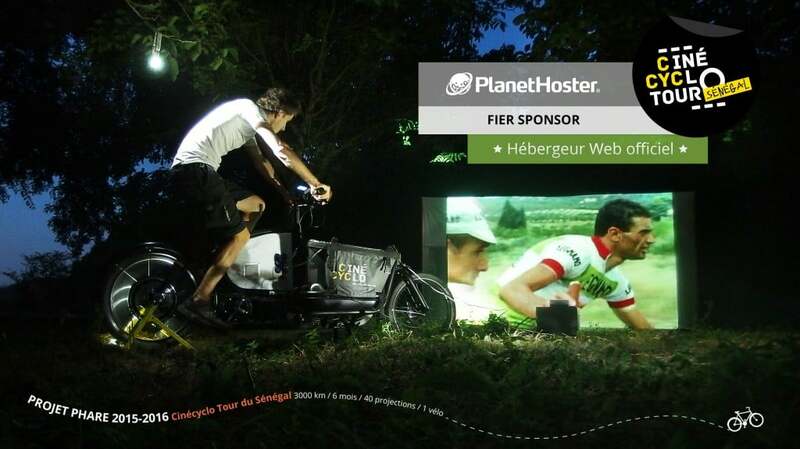 If I ask you to find the link between PlanetHoster, cycling, cinema, Senegal and environmental protection, it is likely that you will scratch your head a few minutes before forfeit. Yet there is indeed a link and it is Cinécyclo. Indeed, PlanetHoster is proud to support Cinécyclo in its flagship project 2015-2016: Cinécyclo the Tour of Senegal. But first, before I present you this wonderful project, I have to show you the organization. Cinécyclo was born from the idea of Vincent Hanrion, a graphic artist, cyclist, traveler, movie fan. While in Quebec, he dreamed of an adventurous journey that would lead to remote regions. During his preliminary research, he found that a traveler is only passing by when visiting and gives little to those who welcome. That’s when he decided to amalgamate all, why not visit Senegal by bike while presenting videos. The project is then Cinécyclo born! Specifically, Vincent will travel 3000 km and will carry 40 broadcasts of local films, short films, and animations for international documentaries in Wolof sensitization on local topics, such as deforestation. In addition to entertainment, the not hidden aim of the presentations is to raise awareness on respect for the environment. The departure is scheduled for November 15, 2015, traveling the roads and tracks of Senegal over a period of 6 months. To arrive at a concretise his project, believe us Vincent has put a lot of energy and topped mountains of problems. The main challenge was to be 100% electricity autonomous, with it, inevitably, comes the problem of transport of the equipment, and there is the project costs added to all this. Therefore the addition of quality partners to play a key role in its realization. Quickly, Vincent contacted PlanetHoster, because after all, having a website is a fixed cost! Without hesitation, we have gladly supported in his efforts. In addition, partners funding is via presentations at festivals and film discoveries workshops. However, although the starting stroke is imminent, there is still much to do and every little help will be appreciated. The most pressing needs are now partnered with an air carrier, a web developer to improving and updating the website and a deal with film distributor. In closing, here are 2 links internet allowing you to learn more.